It is a common thing to have an EPDM Rubber Roof Repair. These membranes are known to prematurely fail. The adhesives used gluing the seams together does not last and therefore compromise the entire roof. If you have not seen the article on the Life Expectancy of an EPDM Rubber membrane, you need to click here first. This will help you to determine if it is worth fixing your roof. The likeliest place for an EPDM roof to leak is at the seams. The number one reason for EPDM Rubber Roofs to start leaking is due to Adhesive failure that bonds the seams together and or where the rubber is attached to metal. If you pull up on an overlapping seam, and the two surfaces separate easily, then you know the adhesives has failed. You should not be able to pull a seam apart with considerable force. Look for voids under the membrane – this happens when the rubber shrinks over time and pulls away from the edging or flashing. This will cause stress on the seams and cause it to fail. If you are a homeowner and there are only a few seams on the roof with a few skylights, then repairing the roof with seam tape is advisable. 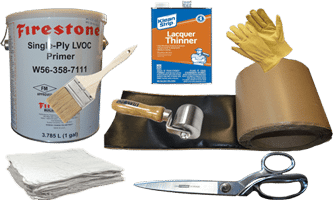 There is a list of tools and materials below that you can follow to make the necessary repairs. If you have a commercial roof that’s over 3000 sq ft, then you should be careful spending the money repairing it. Normally a repair can start at 20% of the replacement cost of the roof and will escalate from there in the next few years. When EPDM seams start to fail, that means the roof was exposed to harmful ultraviolet and not only did the adhesive failed, but the rubber is getting brittle and is starting to shrink. When using the EPDM Rubber primer, make sure you follow the instructions on the can. The contact cement has to be applied a certain way and there should enough time pass by from the time the primer was applied with a brush, to the time when the cover tape gets placed.